TV18 Broadcasting Ltd swung to a first-quarter operating loss as expenses increased and revenue fell. Revenue fell to Rs 596.7 cr from Rs 629.7 cr in the preceding quarter. However, operating expenses rose to 595.9 cr from 555.1 cr in the previous quarter. Revenue from media operations fell to Rs 566.3 cr from 628.9 cr in the preceding quarter, while film production revenue increased to 52.6 cr from 4.8 cr. 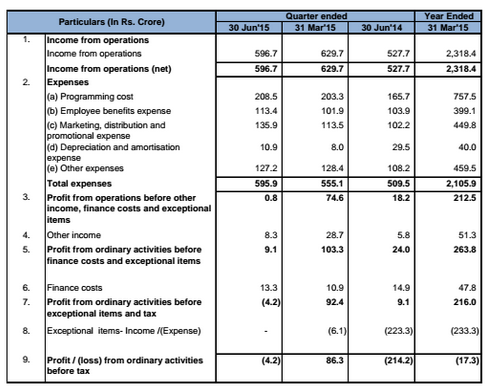 Media operations reported segment loss of 8.94 cr compared to a profit of 85.9 cr in the preceding three months. As a result, EBITDA, which was 74.6 cr in the previous quarter, was wiped out in the June quarter. In the year ago quarter, EBITDA was Rs 18.2 cr. “…the current quarter includes expenses of the recently launched six regional news channels,” it said. ETV News Odia, the 10th and latest addition to Panorama’s regional news bouquet, was launched on May 4, 2015. It said that during the quarter, CNBC-TV18 continued to be the No.1 channel in the English business news genre with 56% market share, while CNBC Awaaz continued to dominate as the No.1 channel in the Hindi business news genre with 58% market share. The company was acquired by Reliance Industries recently. Its news channel, CNN-IBN, has seen market-share losses while CNBC TV18 has come under increasing attack from ET Now.